This football jersey was donated to Miramonte High School in memory of Jon Sisto, a recent graduate who was tragically killed in an accident in 2005. It hangs where every football play passes it on the way to the football field before each game. The jersey was carefully folded and sewn onto a white silk backing, and matted with a raised green mat to create the necessary depth. We chose a deep silver frame to surround it. The school’s colors are green, silver, and white. 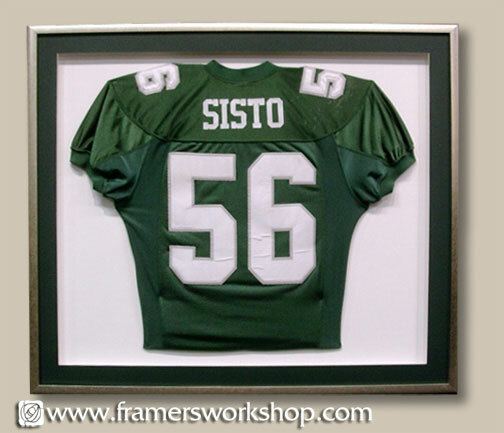 For more framed sports jersey examples and pricing, see our Discount Framing Page..